First infusion is pale green. This Long Jing King is a 6 out of 5. There is nothing else like it. 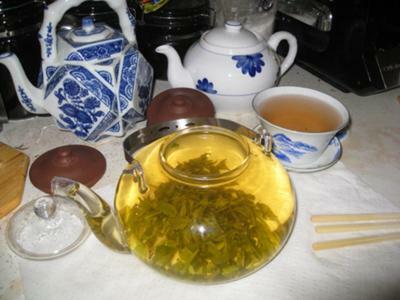 This is the real Long Jing, true Long Jing. It is plain and simply magical stuff, the warm creamy flavor and the colors from pale yellow/green to bright orange. It surprised and amazed people. The Chinese people who never had seen such a thing. The Dragon Well is your pot of tea!! Has to be the coolest tea of all time. My favorite had been the Tieguanyin but this King Grade Long Jing destroyed my brain. It is now my most favorite tea. Even your Long Jing 4-in-1 Samplers are close. The Jipin/9th level is closest but still way far away. In fact I would say it is not Jipin it is maybe 8th level. 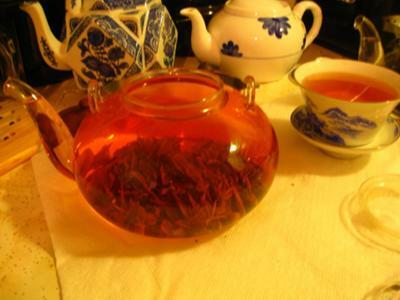 I wanted to mention that the only water I use in brewing your teas and other high and super grade tea is Eternal Artesian Water from New Zealand. This water is amazing. When you drink it plain not as tea it feels like velvet in your mouth and goes down feeling the same way. It is amazing but expensive great water for precious teas. Please have a look at the Eternal web site to learn about what it is and if you have the chance please try some. This water is very worth trying----no water makes better tea than this water! When Eternal is not available which happens occasionally I use FIJI artesian water from Fiji but the Eternal is the best.